Located Directly On The Leland River. Here is a beautiful 4 bedroom family house in a peaceful neighborhood in the village of Leland. 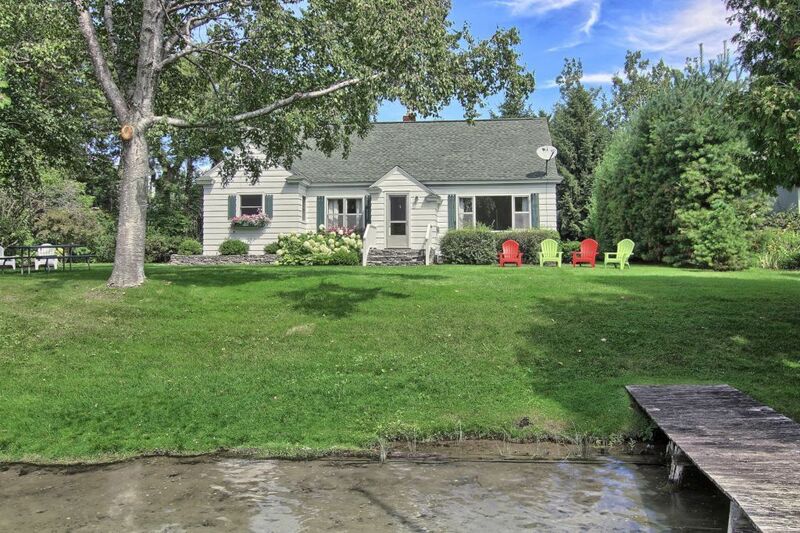 River's Bend offers easy walks to town, great bike riding on quiet streets, swimming off the dock in crystal clear water with hard sand bottom, and quick access to both Lake Michigan or Lake Leelanau beaches 5 minutes away. This charming updated 2 story Cape Cod house sleeps up to 8 guests with 4 bedrooms and 2 baths (no tub). The living room is spacious and comfortably furnished. The dining room adjoins the living room and the kitchen is off the dining room. All three rooms directly view the river. The kitchen is equipped for gourmet cooking and features new appliances including dishwasher. The washer and dryer are in the basement. The house has a water filtration system. Hardwood floors throughout first floor, carpeting upstairs. Big flat HD Smart TV in the living room which has cable and DVDs. Wifi included. Games and books on hand too. Leland is ideally located on the Leelanau Peninsula, with beautiful Sleeping Bear Dunes, Northport, Suttons Bay, wineries, hikes, bike trails, historic sites and beaches all close by. Bike and boat rentals are available nearby. The house and location are perfect for all ages and interests. We are sure you will enjoy it as much as we do! Outdoors is simply beautiful! Tranquil lounging on the river and backyard fun can be had here. Spacious yard for kid play or restful relaxation for Mom and Dad. There is a dock provided. Easy to rent canoes, kayaks and pontoons. Boat launch is walking distance from the house. Channel down the river to Lake Leelanau for all watersport fun. The river is sandy and shallow at the shore so makes for a perfect play spot for the kids. Outdoor furniture and a grill is provided. The village of Leland offers plenty of shopping and dining. Rare book store, sweet shops and gifts galore. Lake Michigan is on the west side of town and offers a beautiful marina and 'Fishtown' not to be missed for more shopping and eats. This area is located between Northport and Glen Arbor. Travel the M-22 corridor and visit local beaches, sand dunes, roadside farm stands and so much more. Visit dozens of wineries in the area too. You will not be disappointed when you stay at the Rivers Bend. We have been married for over 30 years and are lucky to have three grown children, who love going to the house as much as we do. We can't go often because of work schedules, so we like to think of other families enjoying the house. Our many repeat guests comment about the cleanliness and suitability for families of River's Bend. We purchased River's Bend because of its quiet family-friendly location in the center of Leland and the quiet serene beauty of the Leelanau Penninsula (Michigan's little finger), its sand bottom river and lakes, and proximity to Sleeping Bear Dunes National Park and many, many recreational, art galleries and cultural activities. Just walking or biking around the village of Leland is a genuine pleasure with its great restaurants, wine tasting, gift shops, historic Fishtown, access to Manitou ferry, and historic houses. We like to bike, walk, climb the dunes, swim, fish, bird watch and kayak outside. Inside we love watching the river drift by, cooking while enjoying the waterview, playing cards and games. We just enjoy being right on the river in the heart of Leland! River's Bend has two full bathrooms, one on each floor. As the map indicates, the home is centrally located in the Village of Leland, Michigan on the Leland River. The home is situated directly on the banks of the Leland River (also known as Carp River) equidistant between Lake Michigan and Lake Leelanau. There is no road between the house and the river. The home is out fitted with central air conditioning. The home has a combination of central air and gas heat. Beds are made-up and ready for occupancy. A washer and dryer are available in the basement. A natural gas clothes dryer is availabele for guests. There is a one car garage available for use as well as parking for two cars in the driveway. A single car garage is available for your use. Towel sets are provided in both bathrooms. Living room has a large picture window with a view of the river. salt and pepper, coffee creamer, sugar and filters. Full kitchen with all the amenities. Smart HDTV is availbale in the large living area. The home is otfitted with Cable TV. A variety of books and magazines are available. A croquet set is available in the garage. As indicated in the photos, the home has an expansive lawn and is beautifully landscaped. Although a boat is not available for guest use, a boat dock is available. Water depth at the dock varies; however it approximates 4' in depth. Boats may be launched nearby. Great little home right on the river. There was a bit of snow that fell the weekend we stayed and the view out the back window overlooking the river was gorgeous. Thoroughly enjoyed staying at Leland River Cottage! The river cottage is a welcoming retreat that is beautifully landscaped and immaculately clean. We hope to come back again! Beautiful location. Great for kayaking. Owners respond quickly to questions. The gorgeous Leelanau Peninsula has something for everyone, beautiful beaches, charming villages, wineries, festivals, hiking and biking trails, Sleeping Bear Dunes, historic sites and art galleries. Truly, something for every member of the family. The balance of the rental amount, the Michigan Use Tax of 6% and a refundable damage deposit of $750.00 are due 120 days prior to check-in.